We’re almost back in real time. I have one final “50 New Experiences” post that’s nearly finished. But for now I’m interrupting with the trip to celebrate that 50th birthday. I’ve wrote a lot about transition days while we were in Europe–this blog describes a transition day-and-a-half to get to our vacation destination in Kona. We left Pueblo after work on Wednesday with the rest of the Thanksgiving traffic. I’d booked travel on Thanksgiving day because (a) it was a good deal and (b) it allowed us to maximize weekends and paid days off (mostly for me, my wife the contractor only gets paid when she works) and (c) I figured it would be relatively mellow. Once we got started–we had to go back to turn the thermostat down–the drive wasn’t too bad. We were happy not to be going south; for whatever reason, that traffic was much heavier in that direction. We attempted to have dinner at the Colorado Springs outpost of Bingo Burger, but found it closed. Instead, we carried on to Castle Rock to get salads (and cookies) at Mad Greens. Luckily, we arrived twenty minutes or so before their scheduled closing. I had my go-to Don Quixote with Buffalo chicken and Maureen opted for the Mad Molly Brown with steak. It was as satisfying as usual, though Maureen would opt for a dressing other than the Sherry Molasses Vinaigrette next time. Our destination for the night was the Renaissance Denver Stapleton, where we had reserved the park and fly package. It was only a few dollars more than the budget hotels offering similar packages and I think it was worth it. It will undoubtedly be the nicest place we stay on the whole trip. And the people were especially nice. 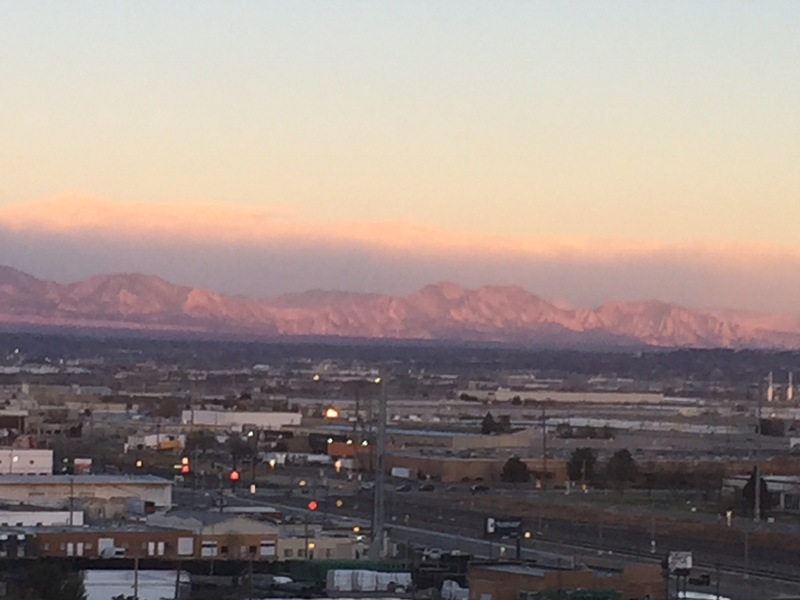 Our 12th-floor room (with balcony) looked out onto Denver and the foothills. After a decent rest, we were planning a walk in our old neighborhood, but the morning was unpleasantly windy, so we drove to Starbucks instead. Boring, yes, but dependable and healthier (?) than McDonald’s. We did a little tour of the old ‘hood (in the car) afterwards. Some changes, many things the same, just like anywhere. We do still miss Park Hill. The shuttle to the airport was uneventful. Checking in at Alaska netted us exit row seats for the longer flight from Seattle to Kona and TSA pre-check at DIA. We’d opted for an earlier shuttle in order to lunch at Root Down and we did just that. I had the Bahn Mi turkey burger (reliably good) and Maureen had the short rib tacos (also good). We filled our water bottles at their filtered-water station and took a lap of the terminal in lieu of the outdoor morning walk. We shared our row with a serial entrepreneur on the first flight who was very encouraging about our ambitions. In front of us was a young couple with a very cute baby who acquitted himself well throughout the flight. 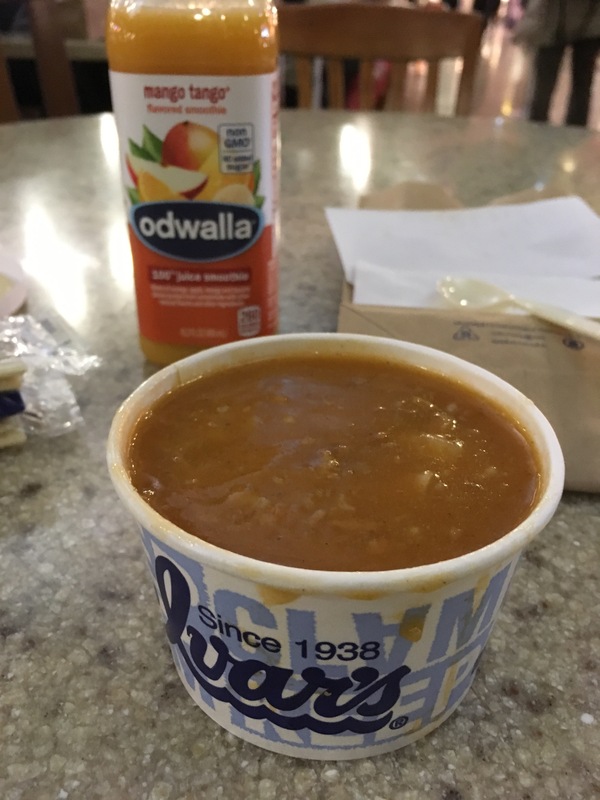 In Seattle, we stopped in to Ivar’s for a snack. I had red clam chowder, a happy find since I’m less a fan of the white version, and Maureen had some pretty tasty French fries. By the time we walked a little more and made our way to the N gates, our flight to Kona was boarding. We had the exit row to ourselves, which was quite the treat in the era of packed planes (an advantage to holiday day travel?). We had pre-ordered food for the flight (on the Alaska Airlines app), which ended up being a good idea, since it meant we were served first and didn’t have to wonder whether there would be any left when they got to our row. It was typical airplane food, and met our needs. The rest of the flight was uneventful, though they did serve complimentary Mai Tais about 90 minutes out from our destination. Upon arrival, we met up with the young couple and baby again, and he was–remarkably–still smiling. We collected our bags and caught the rental car shuttle (ah, the joys of transition days!). At the rental car station, there was a large line, so we opted to try the kiosks. It may not have been individually faster, but the presence of the kiosks meant far more people could be checking in at once. After receiving our “slip” from the kiosk, we went out to the cars, where a representative offered us a small Hyundai (supposedly what we reserved), a sporty American sedan, or a mini-van, all at the same price. After just a little deliberation, we went for the mini-van. They did not offer a convertible at the same price, sadly. We took our first drive in Hawaii in the dark, found our resort, got our key from the night guard, and collapsed. It had been a long day, but we could hear the ocean and were in Hawaii!